What do the speakers get out of PubhD (apart from free beer)? 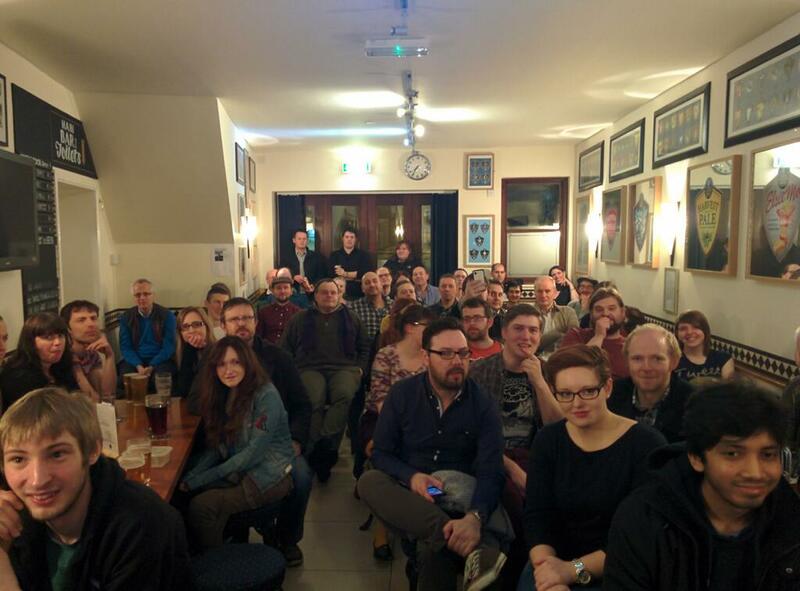 The first PubhD event went very smoothly and the audience seemed to enjoy it. The format worked and it was a very interesting evening. But what did the speakers think? I really did get a lot out of the PubhD event last week. It was not only fantastic practice with my own material as I’m working on tweaking this at the moment, but also I wanted to do it for confidence reasons (as I’m preparing for my viva exam later this year). The audience was really great with their interest and questions, but I appreciated the level of the presentation because academics get too caught up in their own world. The idea of having the talk alongside a pint sounded best to me and I’m sad that tomorrow evening I’m not likely to be repeating this although my presentation will be held around the corner from a pub. Drats! The first PubhD event went down as smoothly as the free beer I was plied with. The set up was well suited to the concept – a back room in a pub crowded with interesting folk. All three talks seemed well received by the audience and it was great to see so many questions (of such sophisticated content) being asked. As a speaker, I particularly liked seeing how the other speakers chose to present their subject areas and this has given me some ideas in terms of how I might present in the future. Presenting such isolated and specialised research to ‘lay people’ is helpful in terms of building confidence and learning how to transfer knowledge in different ways to diverse audiences. It is my belief that a true specialist – an expert – should be able to successfully inform anybody of their subject area. Being able to do this represents a real closeness and an intricate understanding of the subject area. PubhD represents a forum for experts to truly test their knowledge, to gain experience presenting, and to be witty, sophisticated, and drunk all at the same time. No complaints from me! So, no complaints from the audience or the speakers! As you can see from the blog header, we’ve rebranded! To be honest, we didn’t really think too long about the original tagline, just knew that we needed one. We’re not that attached to it! About the layperson thing – I guess I’m concerned most that the term is a little antiquated and still a bit of a mildly loaded word like ‘blue-collar’ or ‘working class’, especially when preceded by the abbreviation of ‘PhD’. I wouldn’t want anyone to perceive your fantastic initiative as this being an ‘US’ vs. ’THEM’ kind of event in the way that academia used to be (& still is) dominated by upper-middle class and upper-class people. It doesn’t presume anything about the audience. And it also sets the scene: this is a friendly chat amongst friends in a pub, not a Powerpoint led presentation. We think the first event on Wednesday 22 January 2014 went very well, but would welcome your feedback to improve it. Perhaps the first one was so well attended as it’s new and exciting? And as we had been plugging it for 2-3 months? We understand that it was uncomfortable sitting by the door, as people were moving in and out of the room throughout the evening. We may have inadvertently created that problem! We’ve been pushing furniture forward to create that space. What we actually need to do is reduce that space to a minimum so that it is not a seating area, and instead “move” that space to the front of the room. That should help a lot. The advantage of not having a projector is that it doesn’t matter how close you are to the speaker at the front of the room. We’ll see what happens in February, and then re-evaluate the situation. If it still looks too small, we’ll investigate moving to a different venue. Yes, we know we weren’t very strict with our timings. Hence, we finished at about 10:05 pm. This was too late for some people who had to catch last buses. We will attempt to be a bit more organised. 3 x 30 minutes (strict!) for the talks and Q&A. 2 x 10 minute breaks. 10 minutes contingency (applause, introductions, etc.). This should ensure we finish by 9.30 pm. People can then leave at 9.30 pm if they have to, or stay and socialise. At the last event, our speakers stayed until closing so there was plenty of time for asking more questions. None of our speakers knew how long they had been speaking for! Sera suggested that simply pointing out the clock at the back of the room is all that was needed (“OK, you’re starting at 7.35 pm, we will be starting the Q&A at 7.45”). On the Facebook group we had a question about the length of the Q&A – why was it twice as long as the talk? We purposely made the Q&A longer than the talk – this wasn’t an arbitrary decision, it was intended. Q&As are often fun! We also thought a longer Q&A would provide the opportunity for the audience to ask questions important to them – questions that a PhD student may not have realised was important to the public. And note that the Q&A is up to 20 minutes. If the questions dry up, we’ll obviously start the break early. We’ll continue with this policy unless, of course, it seems to be not working. We thought all three Q&As on Wednesday were fascinating with excellent questions – and the speakers certainly thought so. (Hear an interview with all three speakers on this week’s episode of The Pod Delusion – we specifically asked them about how they thought their Q&As went). One thing we will try next time is to control the Q&A a little better. For example, we can select audience members instead of the speaker doing it – let the speaker relax a little after their 10 minute talk and not have to deal with that aspect of the Q&A. This will allow us to emphasise that questions should be succinct, and we can also keep an eye out for questions turning into conversations! 20 minutes isn’t a long time and we want to get as many questions as possible into that 20 minutes. We’d love to hear anything else you can think of – we want PubhD to be as inclusive and enjoyable for as many people as possible. If you came to the first PubhD event on Wednesday, you would have heard Sera Baker’s fascinating talk about her archaeological research into Pompeii. If you want to learn more about this subject, and see some photographs this time, Sera is doing a longer talk at a fundraiser for The Framework Knitters Museum in Ruddington. Come learn about life in Roman Pompeii & Herculaneum next Thursday 30 Jan 2014 at The Framework Knitters Museum in Ruddington, Nottinghamshire in aid of their fundraising efforts to buy a historical cottage onsite and preserve a part of Nottingham’s industrial textile heritage! There will be lots of pictures of Pompeii & Herculaneum in this illustrated one-hour lecture. Come ask me about working in the area for the last decade and what you’ve always wanted to know about being a Roman! Starts at 7.30 pm with a question and answer period as long as you’d like! Tickets are just £5 and I promise it will be exciting! It certainly sounds interesting. And remember, it’s for charity!